"The image of the dummy's head formed itself on the screen with what appeared to be almost unbelievable clarity... 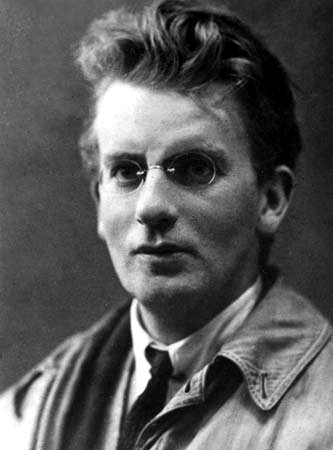 I ran down the little flight of stairs to Mr. Cross' office, and seized by the arm his office boy William Taynton, hauled him upstairs and put him in front of the transmitter..."
John Logie Baird was born in Helensburgh, Argyll, a coastal town twenty five miles north of Glasgow. He was the fourth child of Jessie and the Reverend John Baird, and the family lived in a comfortable house nicknamed "The Lodge". Baird was an imaginative and adventuresome child; because of his curiosity, the Lodge was the first house in Helensburgh to have electricity. He set up a lighting system in the home using telephone wires he had run from his house to four friends' houses to conduct electrical telephone-like exchanges. (He was made to take down the wires after they tangled up an automobile driver and caused an accident.) The home electrical system was run by a petrol-powered generator in the back garden. "I had no intention of flying, but before I had time to give more than one shriek of alarm, Godfrey gave the machine one terrific push, and I was launched shrieking into the air. I had a few very nauseating seconds while the machine rocked wildly and then broke in half and deposited me with a terrific bump on the lawn." Baird earned an electrical engineering diploma from the Glasgow Technical College in 1914; he intended to upgrade to a Bachelors of Science at the University of Glasgow, but was interrupted by the outbreak of the Great War and he never returned to graduate. He instead moved to London, where he eventually set up a laboratory at 22 Firth Street in the Soho district. 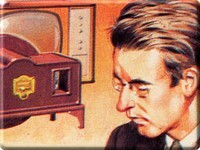 Baird achieved a remarkable string of "firsts" with the television system. He was the first person to produce a live, moving grayscale television image from reflected light. His first public demonstration of moving silhouette images on television was performed over a three-week period at Selfridges department store in London in March 1925. 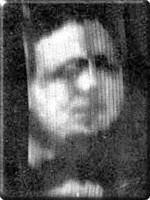 Baird produced the first real television image in his laboratory on 2 October 1925. It featured the head of a ventriloquism dummy named "Stooky Bill" displayed on 30-line vertically scanned images that moved at a rate of five frames per second on a screen that was about the size of a business card. In his excitement, Baird fetched a young office worker, William Edward Taynton, to see what a human face would look like on-screen. Taynton thus became the first person to be televised in a full tonal grayscale range. In January 1926, Baird repeated this transmission in his lab for members of the Royal Institute and a reporter from The Times. By this time he had improved the speed of the frames to 12.5 per second. This marked the first demonstration of a true television: a system that could broadcast live moving images with tonal gradation. Two years later Baird achieved a colour broadcast by placing scanning disks with three spirals of apertures at the transmitting and receiving ends of the line. Each aperture contained a filter for a different primary colour. Three light sources at the receiving end alternated the illumination of each filter by wire. 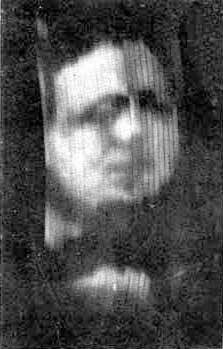 In 1927 Baird transmitted a television signal over four hundred miles from his lab in London to the Central Hotel in Glasgow Central Station. He then established the Baird. Television Development Company, Limited, which in 1928 succeeded in broadcasting a short-wave transmission of the BBC's first television show across the Atlantic from London to Hartsdale, New York. 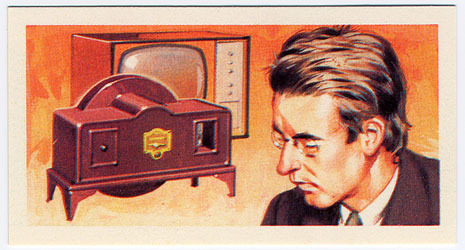 Although his electromechanical television system was displaced by purely electric systems by the end of the 1930s, Baird continued to make innovations in colour transmissions. In 1939 he used a cathode ray tube to create a colour image - (a method adopted by the American broadcasting companies RCA and CBS) - and in August 1944 he demonstrated the first fully electric colour display using a six hundred line, triple interlaced colour system. 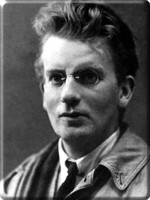 Thus Baird remained at the forefront of television development until his death in 1946. Baird's contributions to modern technology were not limited to television. Before the end of 1926, the same year that marked television's defining moment, Baird also took out a patent on a device that scanned an object with a directional beam of ultra- short radio waves. These waves were then picked up by a suitable receiver, and the amplified signal was combined to form a picture of the scanned object. 3 This research provided an important foundation for the development of modern radar during the Second World War. Baird, John Logie, and Television Limited, "Improvements on or relating to Apparatus for Transmitting Views or Images to a Distance," British Patent 292,185, App. 21 December 1926.